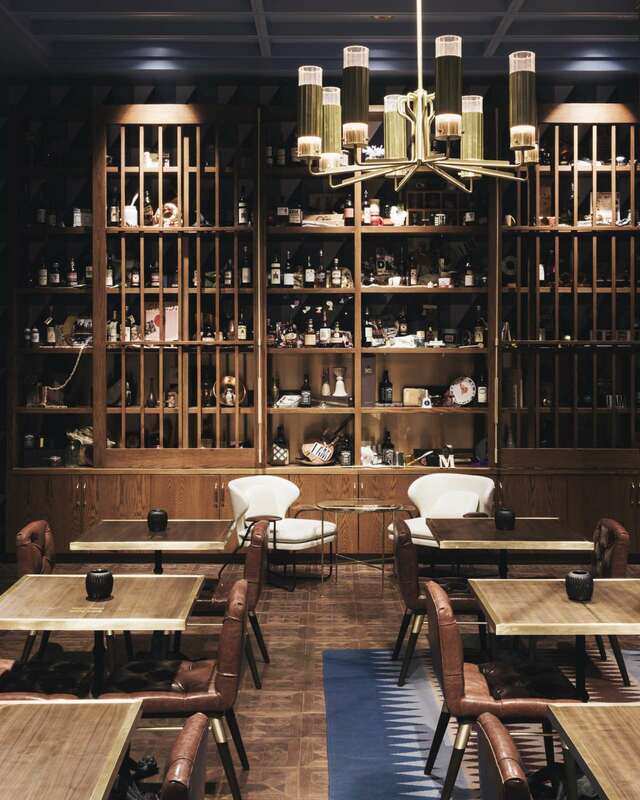 Photo © Parts and Labor Design. 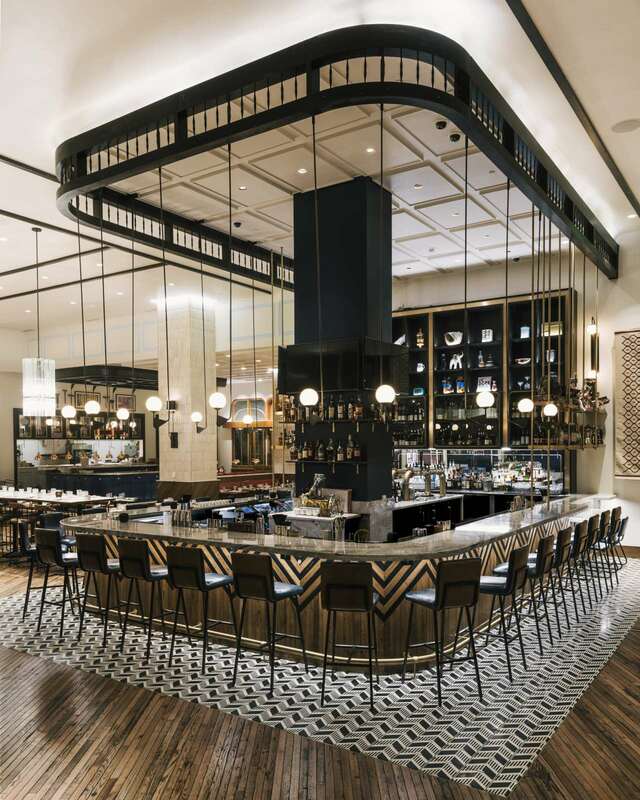 African American influences and American crafts are brought together at Marcus, Chef Marcus Samuelsson’s first standalone restaurant located in the cosmopolitan Washington DC area. 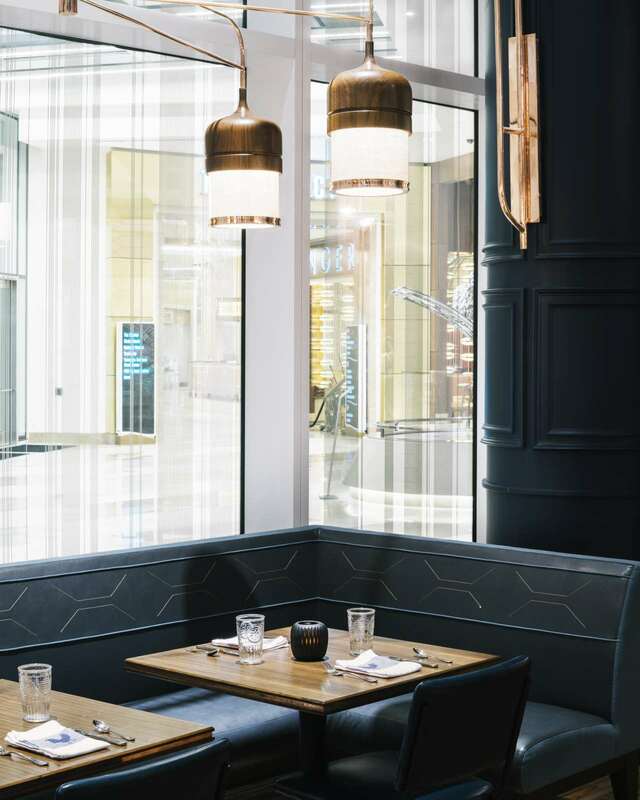 Designed by Parts and Labor Design, this large 5,700 square foot restaurant is situated in the new MGM National Harbor Resort which opened in December of 2016. 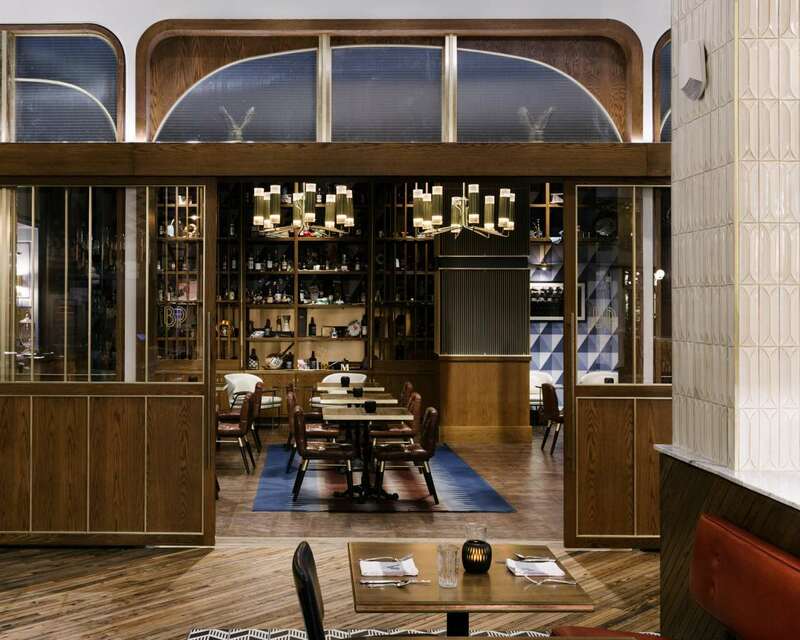 The large layout encompasses a bar, main dining room, central open kitchen, private dining room and a supper club where local live music - in keeping with the African-American/Americana theme - is regularly offered. 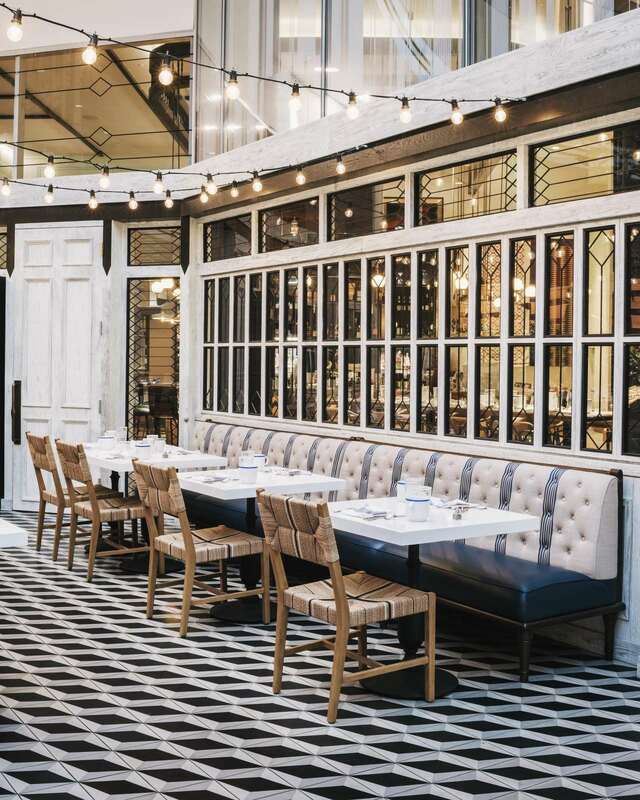 Stepping through the conservatory's antique-white, wooden doors, patrons are welcomed to Marcus’ front hall which features an eye-catching, Americana-inspired compass of rose inlay on the floor. 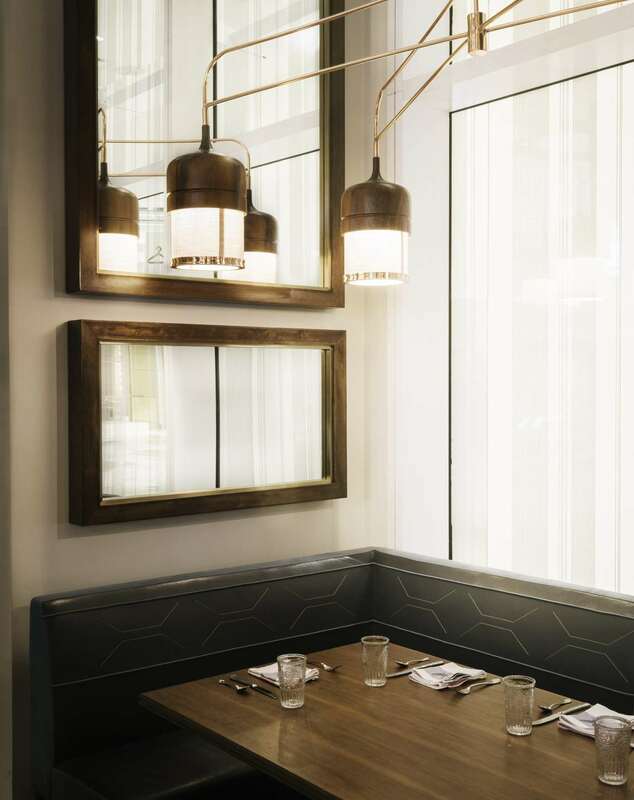 This leads through to the restaurant's planked wooden floor and towards the deep tones of the arresting, bistro-inspired 21-seat bar. 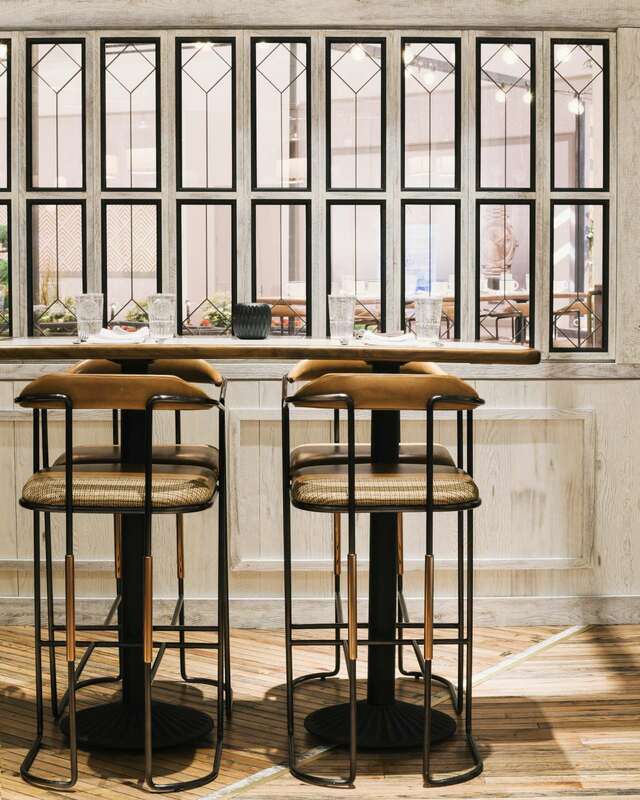 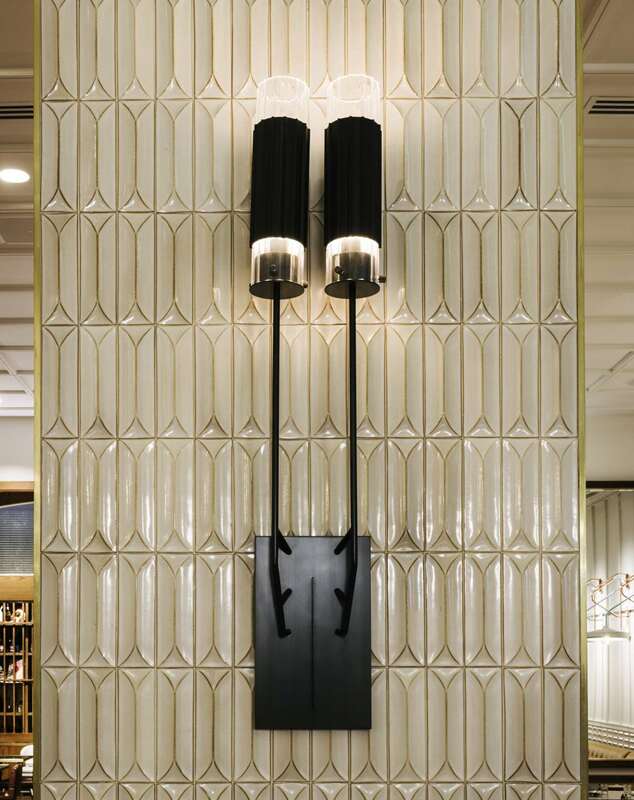 Beige, brown and black chevron tiles on the floor surround the u-shaped, wood bar and continue on the bar itself where the chevron’s black stripes are reflected in the black of the pillar, in the legs of its high stools, and most strikingly in the wooden spindles hanging above. 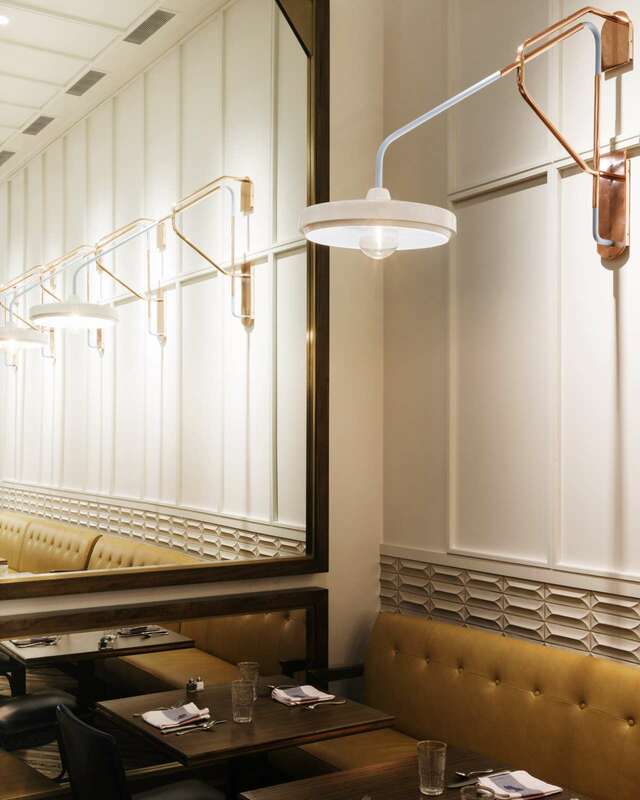 Meanwhile, the 84-seat main dining room is relaxed and intimate, with upholstered booths and chairs in rich amber, blue, and beige tones as well as a multitude of tables of different heights and styles. 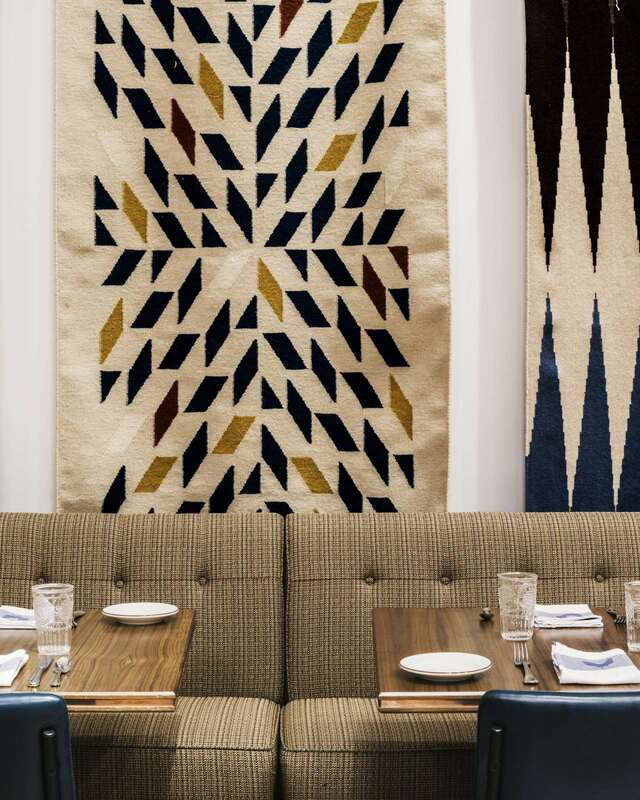 With photos of familiar personalities, warm lighting, African-inspired tapestries on the wall and rugs on the floor, and shelves filled with items one might find in any American home, it is the perfect merger of all things east coast America with east coast Africa. 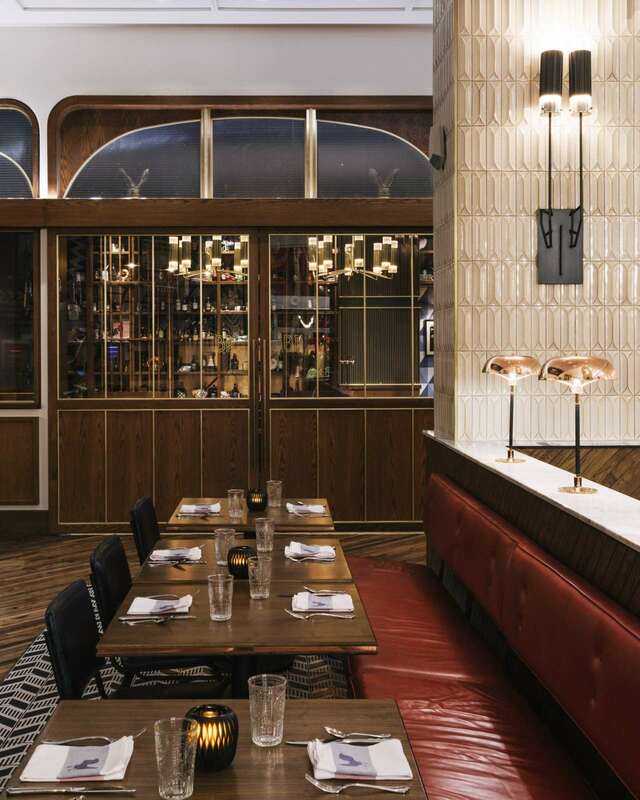 Almost hidden in the back of the restaurant, a prohibition-style supper club hosts live jazz performances can be heard. 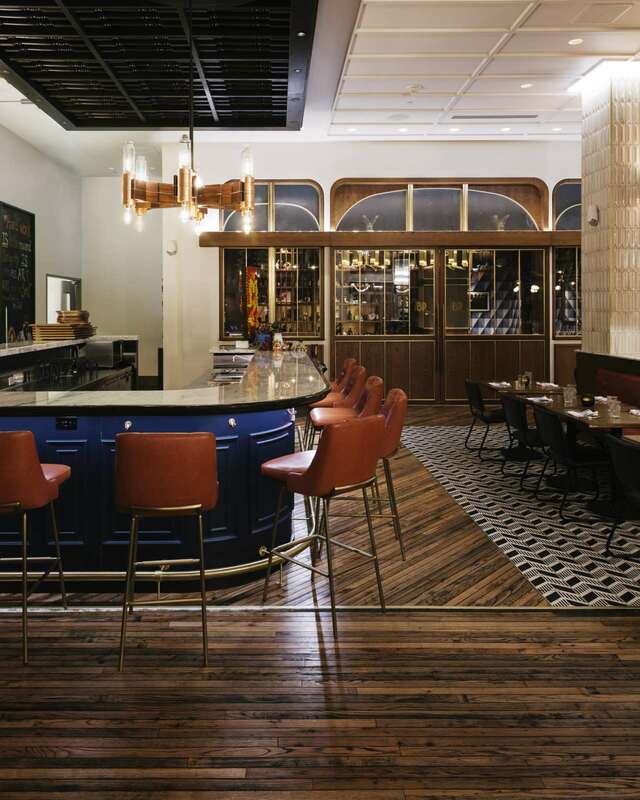 Meanwhile, the central, open kitchen and raw bar feature coffered wood ceilings laced with old-fashioned colonial millwork, ultimately all special touches that make Marcus so welcoming and a "home away from home" for each patron that steps through its wide doors.